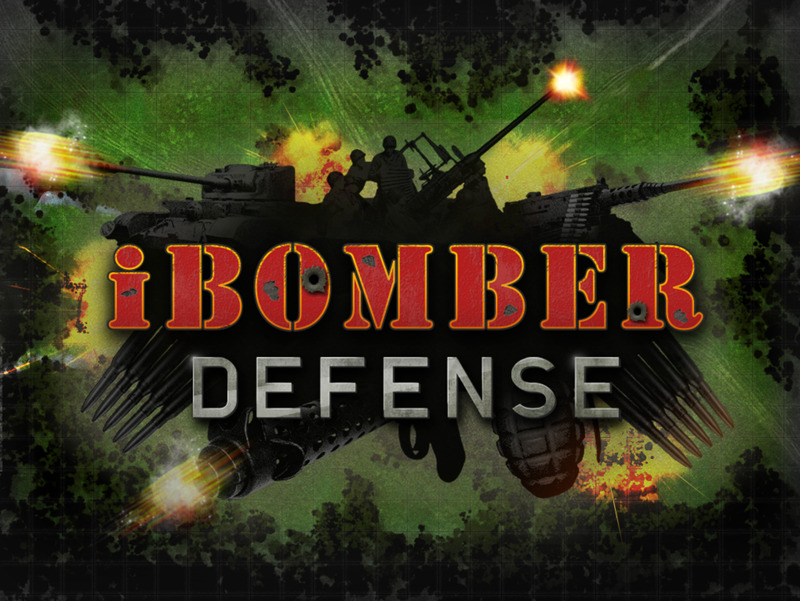 This guide continues the second half and final seven missions of the Allied campaign in the video game iBomber Defense. 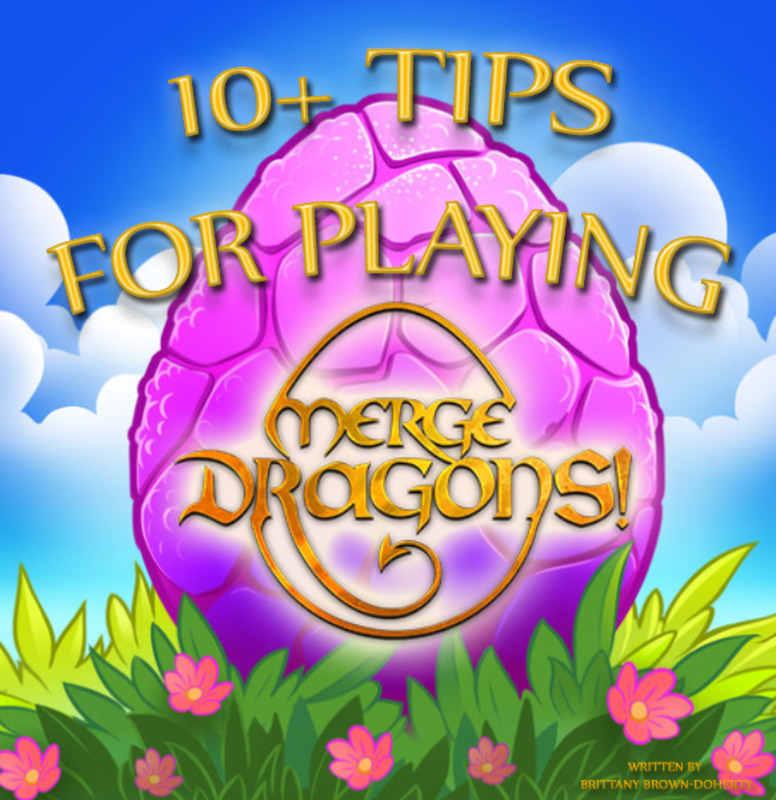 As previously mentioned in the first half, these guides are written for the Veteran difficulty (hardest) and demonstrate methods used to get a Perfect rating on every single map. At this point in the campaign it is important to note that all upgrades have been fully unlocked as of mission 7, since achieving perfect on every mission grants enough victory points to do so. For this reason, victory points and their spending will not be discussed in this half considering they are no longer relevant. Finally, like before, these methods can be used in Quick Play mode in order to unlock the medals Survivor, Base Defender and Turret Guard. This is since both versions seem to have the exact same waves on the same maps. The second counterattack bonus mission brings us again back to the Eastern Mediterranean for another 20 waves of even stronger naval and air units. 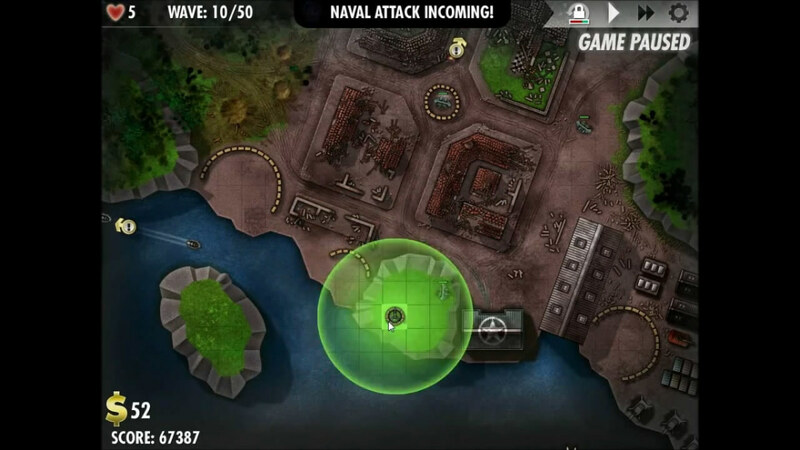 You will begin this mission with the turrets you had built at the end of the previous level and an enemy bomber will come and open up a third route of attack for naval vessels to approach from, destroying the bridge that connected the largest island to the mainland along with anything on the smallest island. With having all upgrades unlocked at this point and the significant numbers of waves in the missions that follow, it becomes a strategically viable option to get to having 3 level three Comms turrets as soon as possible while accruing 150$ saved up at the end of every level. Doing this allows you to get the maximum bonus interest of 50$ per wave. From here on out this becomes a recurring strategy. From the beginning waves up to wave 10 you should focus primarily on getting the full interest bonus from three fully upgraded Communications towers while filling out any open spots on the north and south main land. Cannons are the way to go here, maybe a few extra Machine Gun turrets, but only one additional Anti Air should be required, placed on the largest island under their flight path. On the way up through wave 20 you should be reaching the point where you have packed turrets into every space possible, making sure you have Comms inside of clusters of turrets whenever possible to boost their range and firepower, even if already earning max interest. Turret placement at wave 40. 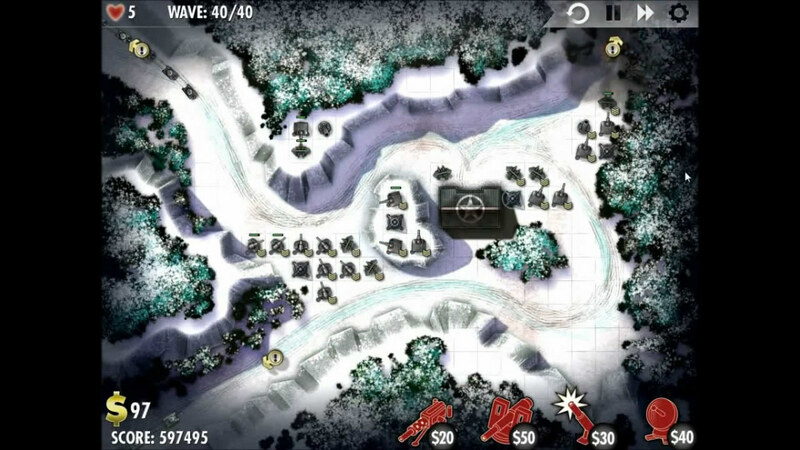 Proceeding onwards in the Allied campaign of iBomber Defense it is time to face the South East Europe level, taking place in a green valley that runs around a central snow covered mountain and lined with even larger snow covered ridges along the sides. 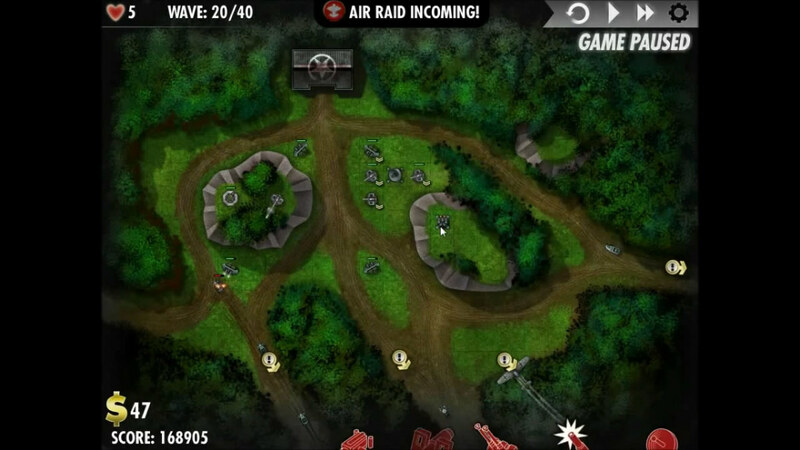 You will have to face a total of 40 waves of enemies of combine d ground units and aircraft. Turret positioning will focus largely on the western half of the map with turrets placed on the central mountain to reach both top and bottom routes. Air units will show up at level twenty and there will a bonus counterattack mission that comes back to this level later on. 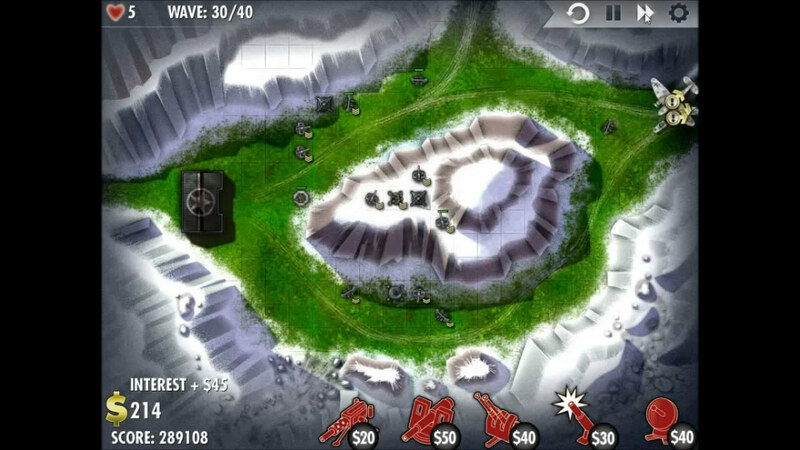 From the starting wave up to number ten it will be best to focus on getting two fully upgraded Machine Gun turrets, one by each entrance with an additional one by the base and a Cannon turret on the central mountain which can fire from said position against both routes. 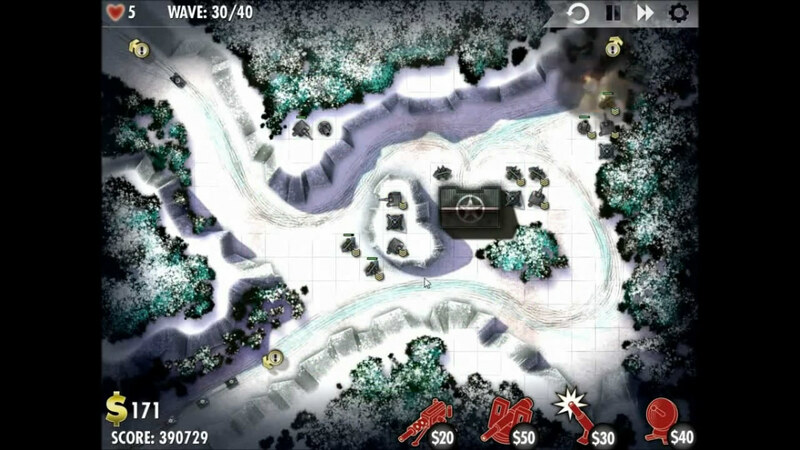 Keep in mind that the counterattack mission will open up a new route to the bottom center-left of the map where you can see a snow covered path. Towards wave twenty you will want to focus on building another Cannon on the central mountain along with an AA turret for the incoming aircraft. You should also be focusing on building new additional fire bases with Comms turrets to boost and start accruing interest to the north and south west portions of the map close to the base. From wave 20 through 30 you should work on upgrading your Comms turrets for interest purposes while adding cannon turrets to all 3 locations built upon so far being the north and south west sides of the map and the central mountain. Work on getting your Anti Air turret up to level 3 during this time as well. The last ten waves should be focused on maxing out each rounds interest bonus while using the extra money to upgrade all of your Cannon turrets towards level 3. It will be worthile to add a second Anti Air turret somewhere along the central path the planes take, personally i choose the east side of the central mountain. The tenth level in the Allied campaign of iBomber Defense and the third mission in this second half of the walkthrough guide takes us to the snow covered lands of Western Russia. You will be facing forty waves of ground units that come from 3 roads emanating from the northwest, northeast and southwest, curling around towards the center of the map where the base lays. There are no air units to face in this level. Turret placement in Western Russia is going to focus on creating a thick line of primarily Cannons all boosted by Comms towers that stretch across the center of the map. This level has excellent places to put many turrets that cover multiple routes. 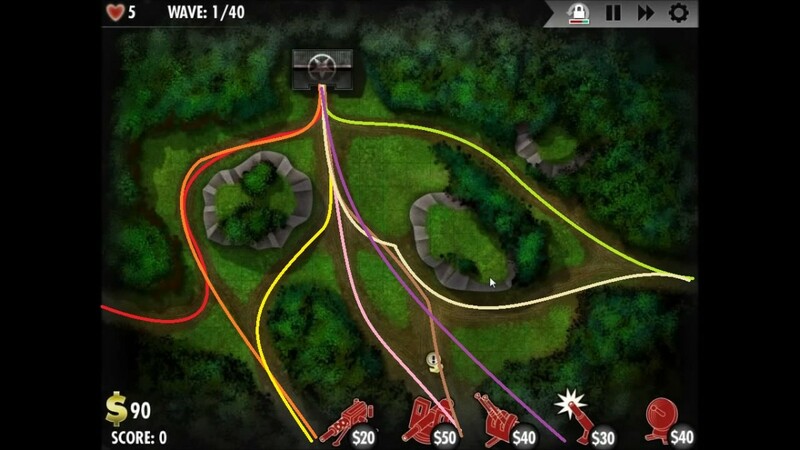 From the start up through wave 10, your efforts should be focused, as is normally the case when facing ground forces, to build at first a pair of level 3 Machine Guns, one on each side of the point where all 3 paths converge. Once these are up you can add another Machine Gun to begin upgrading just to the left of the tiny plateau near your base. Reaching wave 20 should encompass expanding on the turret defenses you have on both the right and left sides of the base, each backed up by level 2 Comms towers that should start accruing interest for you. 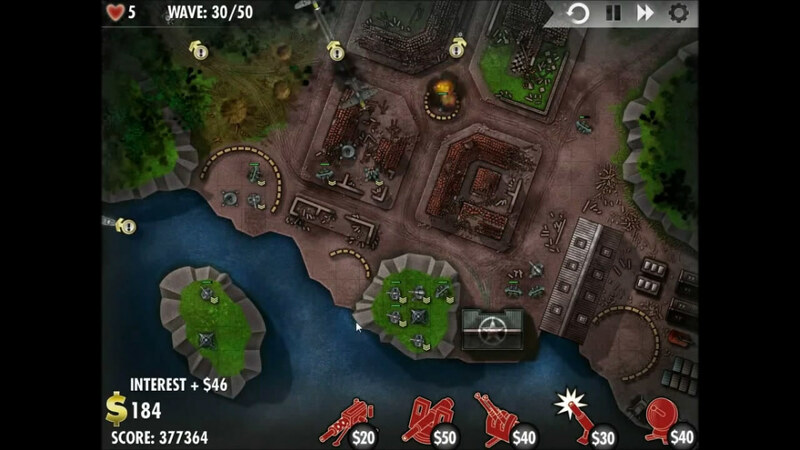 Make sure you start placing level 1 Cannons on both sides along with additional Machine Guns. On your way to wave thirty in Western Russia, start building an offshoot turret base where the top right and bottom left entrance roads converge to one before meeting with the top left road before the base. Try to have three level 3 Comms towers and all of your placed turrets upgraded to their max levels. Sabotage turrets can be helpful here to compensate for the short distances you have to stop the enemy with. Between wave 30 through the finally wave 40, you should be able to use the massive amount of interest you are getting each wave to start amassing fields of Cannons to overpower the enemy. 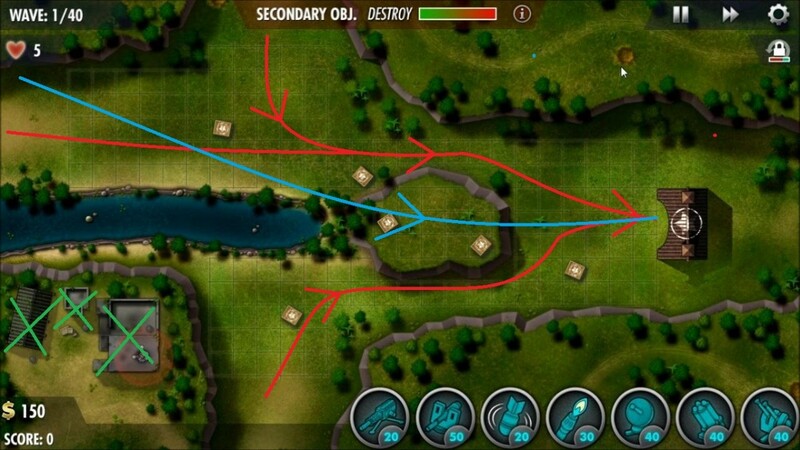 Remember to use the pictures to the right and the video below for more specific details on my turret placements. 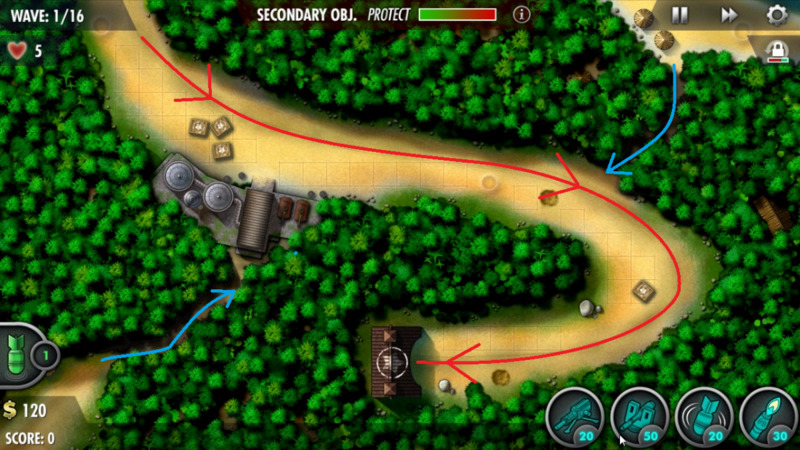 the North East Europe level of the Allied campaign in iBomber Defense takes us back to the green forested lands to defend a base that has 8 different routes of attack, not including the route traveled by air units towards your base. Turret placement begins to get a little tricky in this level as so much room is taken by the roads that placement options are somewhat limited. 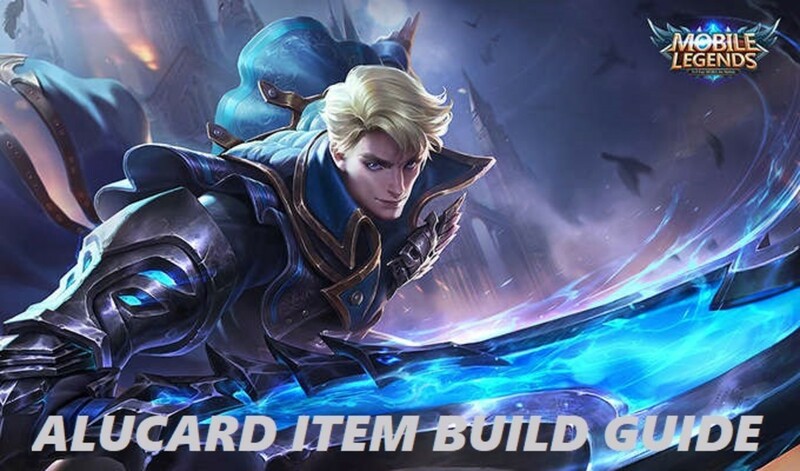 Since this is another mission with limited build spots, upgrading your turrets all the way to their max level is pretty important. The turrets built here will be mostly centered on and around the two central plateaus. There are 40 total waves to fend off in North East Europe and aircraft will begin to show up at wave 20. To start off and get the ball rolling, the way towards wave 10 should focus on getting two Machine Gun turrets on either side of the path where all roads converge. 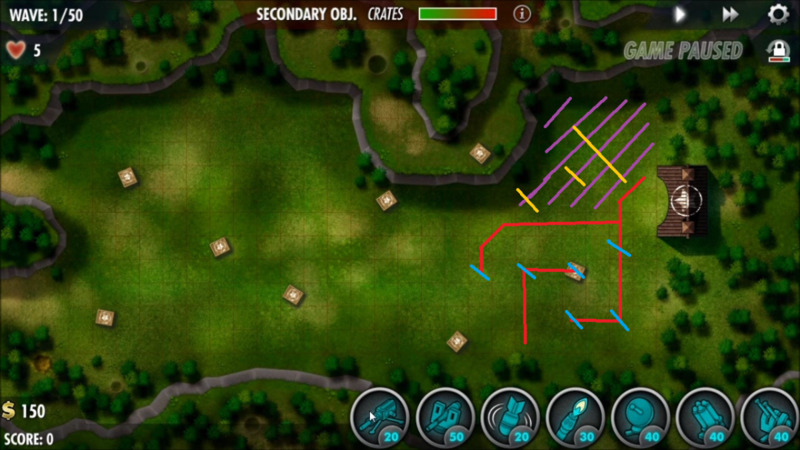 After these first two are up and at least level 2, make sure to place a turret somewhere along the red path, preferably where the red and orange paths meet (see image to right). Getting towards wave twenty should be focusing on adding Cannon turrets to your arsenal, one level 2 Comms tower and an Anti Air turret that could probably do with a level 2 upgrade off the bat, placed on the top left corner of the right-central plateau. The left plateau should have its two spaces occupied, at least one of which should be Cannon, the other can be a Machine Gun. As your proceed onwards from wave twenty up through thirty, expand upon the locations you've begun to build upon so far, getting 3 level three Comms towers placed to boost your turrets and begin the overpowering process once again with 50$ interest bonuses each wave. One level 3 Anti Air turret is still fine at this point, but you should have a couple level 2 Cannons by now. 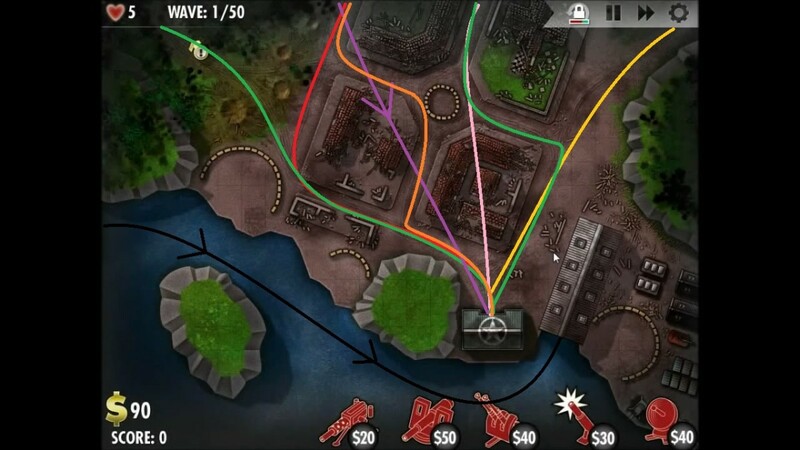 The final 10 waves, which are usually the most drawn out and of course the most heavily armored, will want to be all about getting the mass of Cannon turrets you should have, boosted by Comms, all up to level 3. One additional level 3 Anti Air turret can be placed and if both are boosted with Comms, it will be plenty to stem the tide of all the enemy aircraft you face. Northern Europe takes us back to the icy waters in order to fend off a massive 50 waves of naval vessels in what is quite possibly the most complicated map so far when it comes to predicting the route your enemy will take. Since this map is a series of island through which the ships corkscrew through, it will be important to have a wide range of coverage to handle the enemy. Aircraft start to show up as they have in the past, at wave 20 but for the most part your focus will be on littering the central and right islands with as many level 3 Cannons turrets as possible, all boosted with Communication towers with the occasional Anti Air turret and just a spattering of Machine Gun turrets at some of the bends in the enemies path. From the get go up towards wave ten, you will want to focus as usually, on Machine Gun turrets, placing four of them, one at each of the various bends that the naval vessels make in their paths. This is best seen in the pictures to the right (thumbnail #2). The path towards wave 20 should be one paved with upgrading some of those Machine Gun turrets while building a single AA turret in the largest island's center while covering the right small island full of turrets boosted by a Communication tower. Cannons will be your preferred building of choice from here on out. 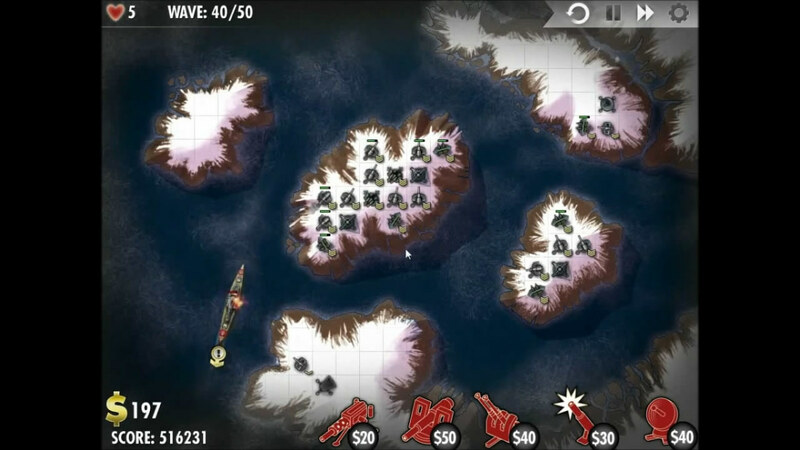 As you make your way from level 20 through level thirty, spend this time accruing interest while upgrading the turrets on your small right island while beginning development on the large central one. Wave 30 itself should also mean having 2 level 3 Comms towers granting you extra money with each round passed. Continuing onwards up to wave forty, you should really be raking in the dough after placing a 3rd Comms tower to provide coverage for turrets placed on the central island while upgrading all three towers to their highest upgrade level. 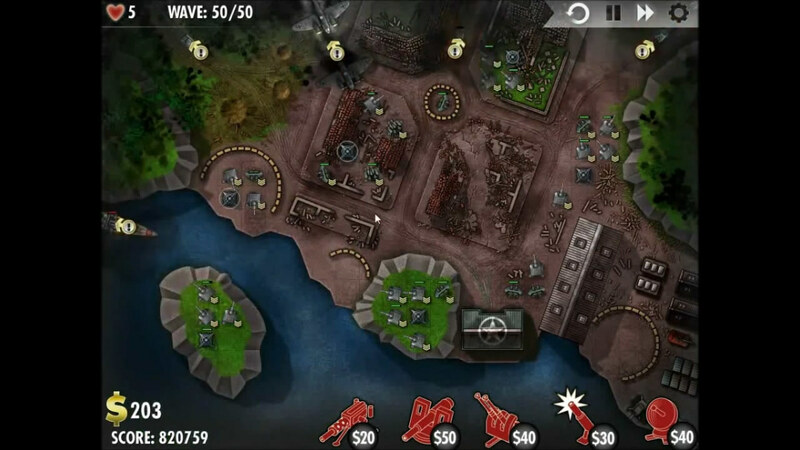 Use the overpowering funds to make the entire central island covered with Cannons except for the boosting Comms and two Anti Air turrets at level 3. 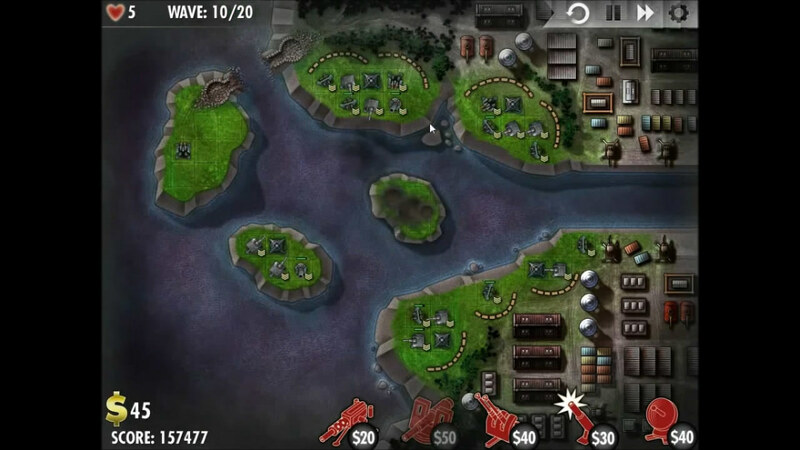 As you head towards level 50, focus will shift onto getting the rack of Cannons seen in the wave 40 picture up to level 3, providing a literal wall of heavy shells to pound the naval vessels into smithereens. The third and final counterattack bonus mission in the Allied campaign actually hops some maps backwards for the first time to the first level in the second half of the campaign, South East Europe. 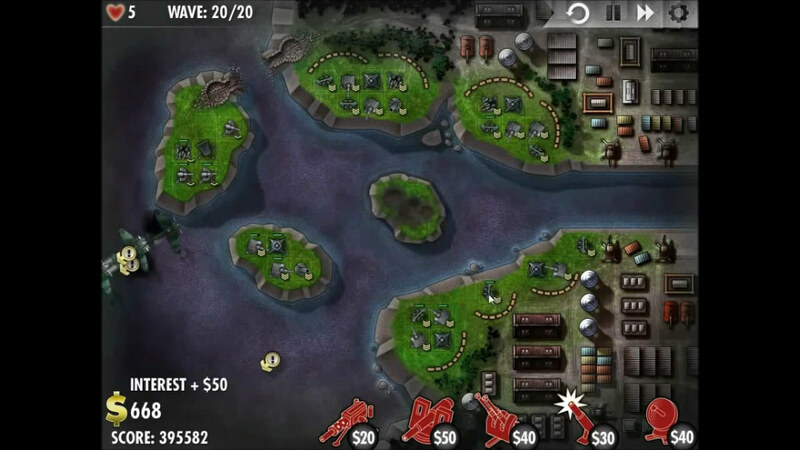 As with the previous bonus levels, we start this counterattack level with whatever turrets were left over from the end of the original set of waves. This counterattack level also has more waves to bonus your way through, facing an additional 30 rounds of armored ground units along with air units showing up at wave 2. The new path opened up in this round will be the snow covered path to the southwest. Although you won't see the path opened up initially, there will also be two routes for incoming aircraft for the first time in this level. 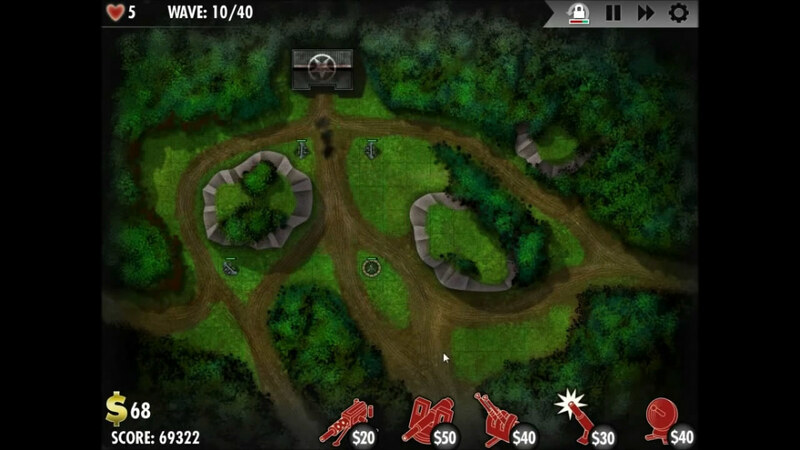 Pretty much off the bat up to wave 10 it will be important to add some extra Anti Air, giving three turrets overall while continuing to extend turret placement from where we left off in the original run through of this mission, focusing mostly on Cannon turrets this time around working from the middle of the map backwards towards the base. Definitely try to have a Comms tower with some turrets near the new opened path. Upon reaching wave 20 you should have already long since been earning 50$ in interest with every wave completing, thus allowing you to grow your fields of Cannon turrets towards your base even further, bringing most if not all for them to level3 until you have no buildable spaces left on the western half of the map. Making it past wave 20 and proceeding towards the final wave of 30 should bring at least one or two more high level AA turrets, bringing the total to 5. In addition, if you have managed to use all the building space on the west half of this map, you may as well start using up the still open spaces on the east side for the pure hell of it. The Germany level is the final mission for you to overcome in the Allied campaign, serving you the greatest challenge so far. 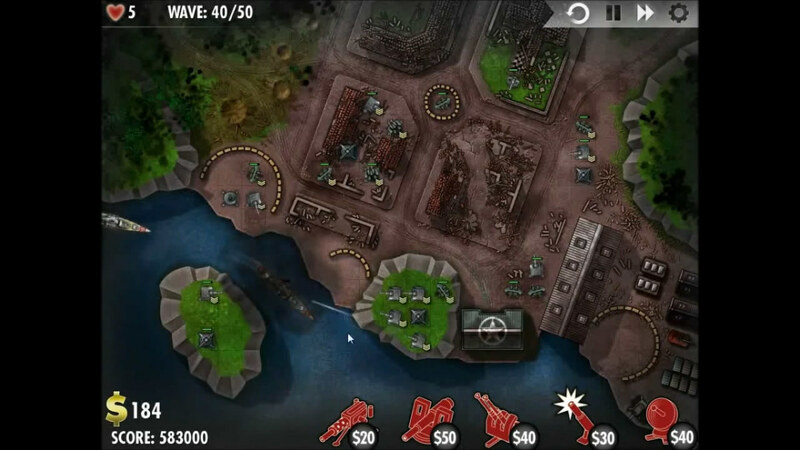 Here you will be facing all three types of units at once, aircraft, naval vessels and ground units galore. This combined with the bombed out city making it difficult to place turrets, it is very critical where you place what in this mission. 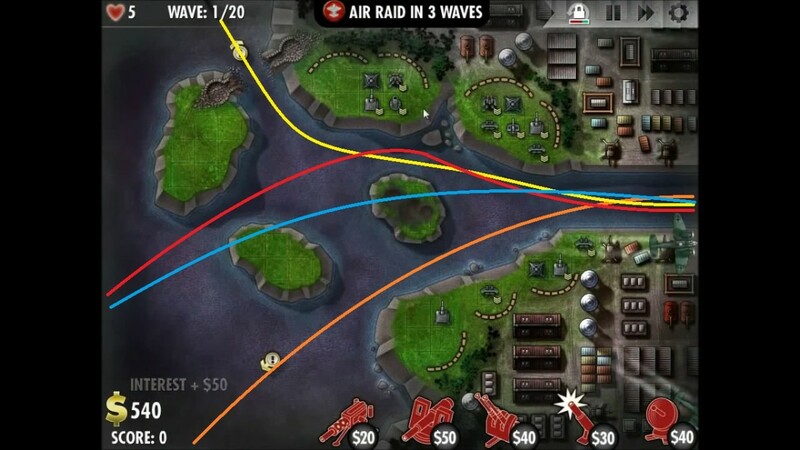 There are 50 waves of units for you to fight your way through with naval units showing up for the first time at wave 10 and aircraft coming on to the scene atypical wave 21. It is almost a necessity to perform the overpowering income trick using 150$+ of saved cash while possessing 3 or more level three Comms towers. Also around the middle of the level, some artillery will come from off screen to open up the pink path traveling through the demolished building, but won't destroy any of your turrets and the area wasn't buildable in the first place. Again it really helps to check the video below or the pictures to the side for more specific details, but the beginning of this mission up to wave ten should consist of strategically placed Machine Guns. One should go on the top right corner of the plateau next to your land base, one more in the small ring of sandbags in the center of town, third turret goes where the green and yellow paths meet to the east and finally one on the bottom right corner of the plateau mentioned above as close to level 10 as possible to stem the naval unit tide. Towards the end of this mission we will sell this fourth Machine Gun turret when it becomes less useful. Waves ten through twenty should be all about building up cannons and a level 3 Comms turret on the plateau we built the two Machine Guns on previously. 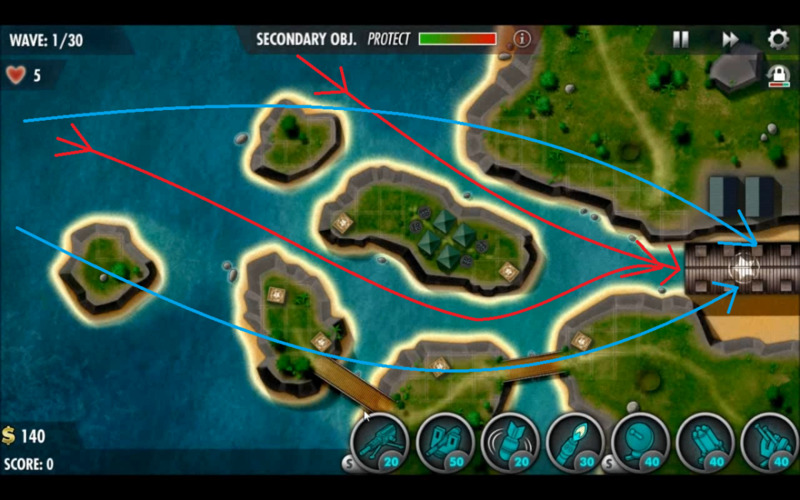 This land mass when boosted with the height and Comms allows the cannons placed there to hit all the ground units and naval units present on this map, as all their paths will end up under their range of fire. On the way forwards towards wave 30 its going to be time to spread out, upgrading the Cannons a bit, but mostly building new ones with Comms boosting in the left most demolished building with some Anti Air turrets there, the sandbags further left of that and the island below that location. Some turrets placed in the small patch of space to the right of your land base can be useful for anything slipping through, however ignore the 2x2 patch of space to the right of your naval base. Its worthless. 30 all the way through the final wave 50 should be about first using your now 50$ a wave interest which you should have reached by now to upgrade all your turrets to their highest level stopping your Anti Air at two level three turrets which are sufficient for the limited aircraft present. It is also a good idea to sell some of your Machine Gun turrets from before to replace with more Cannons, since is the first real level where space is limited to the point where that becomes a good idea. Sabotage turrets can be pretty much ignored throughout the entire level and aren't that useful with the limited space. 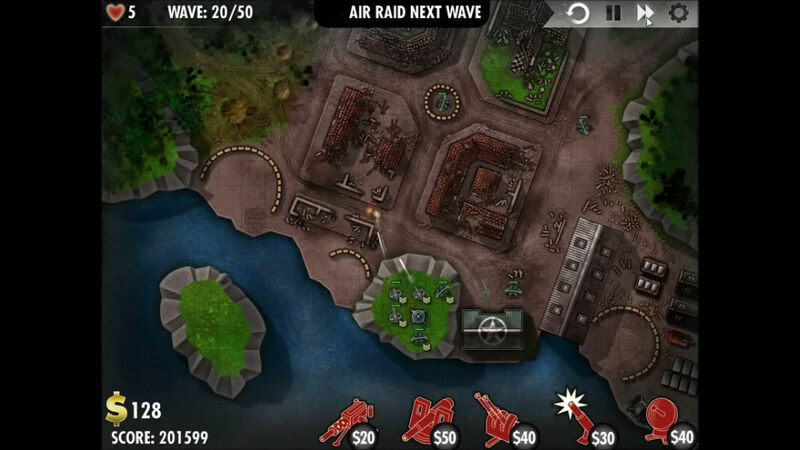 Operation Hailstone - Veteran Level Guide - "iBomber Defense Pacific"
Thank you very much! I'd been struggling on that level for a couple weeks and haven't found a single guide until yours today. Great job! SOE, can I just say that you're amazing? This is awesome. I don't know if I've ever seen better game guides on the site. Bravo.